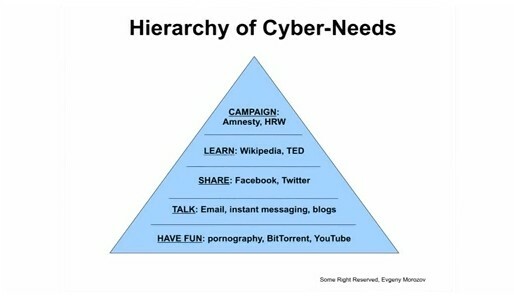 This image comes from the TED talk “How the Net Aids Dictatorships” by Evgeny Morozov. Last week I read Morozov’s book The Net Delusion: The Dark Side of Internet Freedom for the seminar I am taking in Interdisciplinary Readings in the Digital Humanities. While I don’t agree with Morozov’s method of setting up one straw man techno-utopianist argument after another only to, of course, knock them down, he raises a lot of critical questions about the structures of the internet. And, repetitive arm gestures aside, his TED talk contains many useful points as well. Take this image for example. It strikes me as a particularly accurate portrayal of the way most people currently use the internet. Notice where “learn” is in this hierarchy. How accurate do you find this pyramid? What do you think digital humanists can do to expand utilization of the internet for learning?